swim training but also can be used for any other timing. Very simple to operate, it is powered by 1 AA cell. to help keep the unit upright in windy conditions. This electric 31" pace clock comes with the stand on wheels. Shipping quote will be e-mailed or called in to you when we receive the order. Additional shipping charges apply to paces clocks. Call for details and actual shipping costs. This motor will fit the 31" or 37" electric operated COMPETITOR PACE CLOCK. This lens will fit the 31" Competitor place clock. Special handling is required, therefore the correct shipping cost will be determined after the order has been placed. This new larger pace clock has wheels on both sides of its sturdy base. It operates as electric or battery and with a choice of face color. The numbers are extra large for easier fast viewing. Freight charges can be figured accurtely by cll the 800-329-0013 or e-mailing @swimzone@tmpabay.rr.com with your zip code and country. This battery operated pace clock can be carried like a brief case with the convenient handle at the top of the clock. It also can stand up on the convenient flat wide bottom. This is the replacement dial face for the 15" COMPETITOR PACE CLOCK which can be easily replace by removing the old face and putting this new one on. This motor is for the 15" COMPETITOR pace clock. Each of these hands will come in a separate tube to insure their integrity. CALL FOR SHIPPING QUOTE for this item. This wireless pace clock is a basic without horn and battery, AC only. This pace clock does not have a horn or battery. AC only. This controller is needed for the PC Portable Pace Clock and the PC PRO Pace Clock in order to program a workout. Both of these items are found in this section of the website. 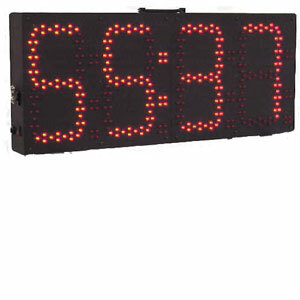 This digital paceclock by Colorado Time System is battery operated and can be used as a Shot Clock for water polo. It must have the controller in order to program a workout. The controller can be purchased separately in this section of the website. This model is wireless. The Pace Clock/Shot Clock, model SC-5 is more than just a programmable clock; it is a water polo shot clock as well. One display can act as both a programmable pace clock for every day use and as a water polo shot clock for games. Choose between a two or four digit display and red or amber LEDs for indoor use. The 9-inch digits provide excellent viewing up to 50 meters away. Deck level or wall mounting options are available. DC3-50' & DC3-150'. This is the replacement face of the clock. The old one can be easily removed and reoplaced with this new one. This digital electric paceclock can be used for training functions. It must have the Colorado Controller in order to preprogram an entire workout. The Controller can be ordered in this section of the website. Two of the clocks can be programmed together by using one controller and purchasing cable to connect them. This clock can also be used as a SHOT CLOCK and a third PRO clock can be added to display game time. This system is the same only it has a wireless microphone, 110V, normally open circuit. This system is referred to as the WSS. The CHAMPIONSHIP Start System comes with a wired microphone. The false start recall feature enables the starter to signal an unfair start and immediately alert the competitors. 360 degree strobe and carrying handle are located on the unit. Additional inputs allow you to add a start transducer or plug in microphone as well as up to ten additonal speakers. Only start systems from Colorado Time Systems (CTS) emit the most fair starting tone. A specialized and unique starting tone was developed by CTS to maximize the consistent distribution of sound across all lanes of a pool. This harmonic rich horn sound is standard in the Infinity Start System and provides your swimmers with the fairest horn start around. Tripod for the Infinity Start System is highly recommended when purchasing the Start System. It is a heavy duty tripod which will hold the weight of the start system and eliminate the chance breakage due to it falling off a table. PLEASE NOTE: SHIPPING FOR THIS ITEM IS $20.00 AND MAY APPEAR DIFFERENTLY ON THE ORDER YOU PRINT OUT.